Gassing up in Hartford Wednesday. Though Connecticut’s gasoline taxes still exceed the U.S. average, they no longer are the national outlier they were a decade ago when motorists pumped 52 cents per gallon into the state’s coffers. 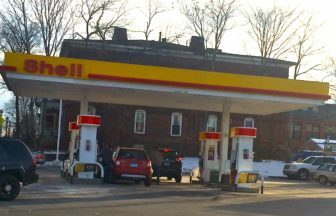 According to the American Petroleum Institute’s (API) fuel-tax rankings, Connecticut could apply the full seven-cent increase proposed Wednesday by Gov. Dannel P. Malloy and its total fuel taxes burden wouldn’t lead the nation or the Northeast. “While Connecticut has refused to increase transportation revenue, 26 states — including eight in the past year — have increased their gas taxes,” the governor said Thursday as he proposed a series of gas tax hikes and establishment of electronic tolling to finance a rebuilding of the state’ infrastructure. The API currently ranks Connecticut ninth nationally in total state fuel taxes at 39.3 cents per gallon, 5.7 cents higher than the U.S. average. In the Northeast, Connecticut ranks third, behind Pennsylvania’s 58.7 cents and New York’s 44.3 cents. When it comes to the retail price, motorists here currently pay an average of $2.75 per gallon for regular gasoline, according to the Connecticut AAA. That’s 16 cents higher than the national average, eighth-highest in the nation and third in the Northeast behind Pennsylvania and New York. Connecticut’s fuel taxes were 22 cents per gallon higher than the average of all states a decade ago, and second-highest overall. But now they’re about 6 cents higher than the average and Connecticut ranks behind eight other states. Below are total state gasoline taxes for all northeastern states and the U.S. average. But just a decade ago Connecticut was in much worse shape in terms of competitive balance. The legislature and Gov. M. Jodi Rell had ordered a major hike in the wholesale fuel tax, which was applied between 2005 and 2007. Furthermore, that tax is based upon a percentage of wholesale prices — and the latter rose significantly in the wake of Hurricane Katrina and the damage it did to the nation’s refineries. A big driver behind that price spike in Connecticut was a wholesale fuel tax that was raising 27.4 cents per gallon and a flat, retail tax adding another 25 cents. Connecticut’s collective fuel tax burden of $52.4 cents per gallon topped the national average in July 2008 by 22 cents, and was exceeded only by California’s 56.5 cents. Connecticut’s fuel tax burden particularly stood out since the state hasn’t had tolls on its highways since the last plazas were removed in 1988. Since 2007, Connecticut has increased gasoline taxes once. The wholesale fuel tax rate rose in July 2013 from 7 to 8.1 percent. And despite that increase, wholesale fuel tax receipts have been undermined to some degree by improving vehicle mileage rates. State analysts project the wholesale fuel tax will raise $257 million this fiscal year — $100 million less than it raised in 2008, when the tax rate was lower. Still, many critics of the governor’s proposal argued Connecticut’s fuel tax system is not competitive with other states.